Summary: Ask Aria Morse anything, and she must answer with the truth. Blessed—or cursed—with the power of an Oracle who cannot decipher her own predictions, she does her best to avoid anyone and everyone. But Aria can no longer hide when Jade, one of the few girls at school who ever showed her any kindness, disappears. Any time Aria overhears a question, she inadvertently reveals something new, a clue or hint. But like stray pieces from different puzzles, her words never present a clear picture. Aria may be the only one who can find out what happened, but the closer she gets to figuring it out, the more she becomes a target. Not everyone wants the truth to come out. 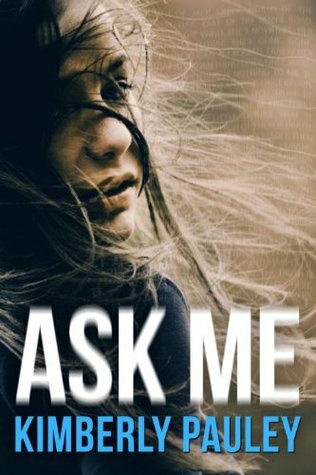 Review: Ask Me is a quick, engrossing read, with a little bit of everything: prophecies, romance, high school problems, and murder. Aria is a fantastic narrator—I spent most of the book torn between the urge to wrap her up in a fuzzy blanket for safety and the urge to tell her to get on the murder-mystery-solving bandwagon. Nevertheless, Kimberly Pauley did an excellent job showing the reader why Aria’s prophetic gift would be an absolute nightmare and building a sympathetic case for Aria being a loner who desperately doesn’t want to be noticed or even have much human interaction. It’s not easy to make friends when you must answer any question you hear, whether or not it’s directed at you. It leads to really awful/embarrassing moments where Aria tells people she barely knows things like “he doesn’t actually like you—he just wants in your pants” or breaks into sing-song-y rhymes or spouts cryptic answers. She has managed to cope thanks to a combination of headphones, loud music, and muttering/whispering answers, but that doesn’t stop her from being on the receiving end of a lot of bullying. Her inability to control her gift also makes a compelling case for why she can’t just walk up to the police and offer herself for questioning or even provide them with information under her own name. Aria was a magnificent character, and Pauley really fleshed her out with all the little details of her life. I especially appreciated the minutia of how poor Aria and her grandparents were, from worrying about things like whether or not the rip in her Goodwill dress was reparable to having to use a landline phone (with a cord!) to talk to a boy because she didn’t have a cell phone to the mention of burning through gasoline in her ancient car that she couldn’t really afford to replace. Her relationship with her grandparents was one of the highlights of the book, especially her grandfather, who didn’t truly understand her gift but still did his best to phrase his questions as statements so Aria wasn’t forced to answer him all the time. I wish we had been able to see more of Aria and her grandmother together—a few stories about what her grandmother had done when she had her gift wouldn’t have been amiss. As much as I loved Aria as our narrator, I felt that the central mystery—who killed Jade¬—was too easy for my taste. It’s probably unfair to compare a single 293-page book to some of the mystery series I have been enjoying lately, but I had already identified the killer before I got a quarter of the way through the book. Despite this, it was still an entertaining read, mostly because I was rooting for Aria to put all of the pieces together and freaking out about just how many people were going to die before she got everything sorted out. Recommendation: Get it soon. Ask Me features a great heroine and a compelling storyline about a small-town murder. Aria’s struggles to deal with her gift and the turbulence in her life means it’s easy to root for her, especially as she tries to figure out how to handle the responsibility that comes with knowing information about the murder that other people don’t. The book is a fast, fun read that would be perfect for a weekend or school break.